Tuesday’s election was one for the history books. 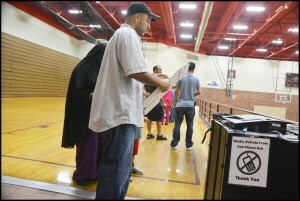 A record 3,543 voters came out, which is unheard of for a Primary Election. Local candidates came close to getting new jobs in Lansing. What a wild and crazy Primary Election. Elections results were tentative after Tuesday’s election because of a computer breakdown at the Wayne County Election Bureau. Final results were not known until Wednesday, and they won’t be made official until the Wayne County Board of Canvassers meets and confirm the findings. For Hamtramck candidates who hoped to go to Lansing, it was close. At one point City Councilmember Saad Almasmari was in the lead for the state representative seat he was seeking. Also at one point Hamtramck candidate Abraham Aiyash was on top in his race for state senator for this district. But at the time the results were fluctuating wildly from the county, and it appeared chaotic until the county was able to get control of the information. Tuesday was also a historical moment for Hamtramck. Some 3,543 voters turned out – something that has not happened since the city’s population was over 50,000 decades ago. It was the same thing statewide and nationwide. Media reports said this was the highest mid-term primary election turnout in 40 years. Precincts in Hamtramck were buzzing with activity throughout the day, including in the afternoon, which is usually a down time. Voters we talked to said they were upset with how things are going in the state and in the country. For Democratic Party voters it appeared to be a backlash against President Trump and the Republican Party. Hamtramck has been a Democratic stronghold for decades and remains one. “I feel a lot of people are dissatisfied with the way things are going,” said Sam Gray after he had voted at the Hamtramck High School Community Center. As for local election results, in the state senate race Adam Hollier won. That didn’t come as a total surprise since he had worked with former State Senator Bert Johnson, who resigned from his seat after pleading guilty to a felony charge a few months ago. Hamtramck resident Abraham Aiyash came in a close second and City Councilmember Anam Miah was way down in the field of 11 candidates. In the state representative election, Isaac Robinson won – again not a surprise since his mother, Rose Mary Robinson, is being termed out of office this term after serving six years. Councilmember Saad Almasmari came in second with Hamtramckan Michele Oberholtzer following closely behind in third. Fellow Hamtramck candidates Syed Rob and Justin Jessop also were in the race but finished well behind. Also of interest to Hamtramck residents was a proposed city charter amendment to change the qualifications for the appointment of a city manager. Without any public promotion, the proposal overwhelming passed, 1,155 to 643. The proposal loosens the qualifications to allow the council and mayor to hire who they think is qualified. The Wayne County millage renewal for the SMART bus system was approved countywide as well as in Hamtramck. In the heated race for Democratic governor Gretchen Whitmer won statewide, but in Hamtramck Abdul El-Sayed was the favored candidate. Wayne County Commissioner Martha Scott easily won re-election. Former Hamtramck City Councilmember Mohammed Hassan finished second. It’s very interesting to note that Mr. Robinson won the State Rep. race with close to 50% in Absentee votes. Will that trigger a State investigation as it’s usually done with “Muslim” Candidates. You beat me to the punch. While some may suspect improper absentee voting given these results, the truth is that absentee ballot voting usually tilts more heavily toward incumbent candidates or well-known local political names. Isaac’s mother, Rose Robinson, was a long-time political incumbent and union lawyer representing AFSCME. This is Isaac’s first major electoral victory – undoubtedly aided by his mother’s name and connections. One race in which is conspicuously ignored is the one in U.S. Congress in which the first female Muslim candidate for the House will be seated in January. Rashida Tlaib, a Democrat, will ascend to the seat formerly held by John Conyers, Jr. for over fifty years. She will be the first Arab Muslim to be sworn in to a Congressional seat in U.S. history and did so despite her main primary opponent, the widely-respected Detroit City Council president Brenda Jones, being endorsed by both Mayor Mike Duggan and the United Auto Workers union. This was not a surprise given the fact Mr. Aiyash, a Wayne State University law student, had raised $104,000.00 in campaign donations during that hotly-contested primary, according to disclosures filed with the Secretary of State. That monetary amount dwarfed most other state senate candidates throughout Michigan this election cycle and established Aiyash as a key political force to be reckoned with in future races. Aiyash had been an introductory speaker at WSU for Abdul El-Sayed during his campaign for governor. Fatema Hossain — Abraham Aiyash is not a student at WSU Law School. Get your facts straight. Also, you write in the same style and voice as Roadman. Coincidence?